Free ABN plus first BAS for free* with Airtax. Create an account and pay when you lodge. Then you're ready to lodge your quarterly BAS. Airtax links to your Uber account so your income and expenses are prefilled. Simply finalise your expenses and you're ready to go. Apply for an ABN with Airtax for free (we'll also register you for GST which is a requirement for all rideshare drivers). We'll email you with your ABN once it's registered. Getting tax-ready as a rideshare driver. Just follow these simple steps and you'll be ready to start driving in a few minutes. 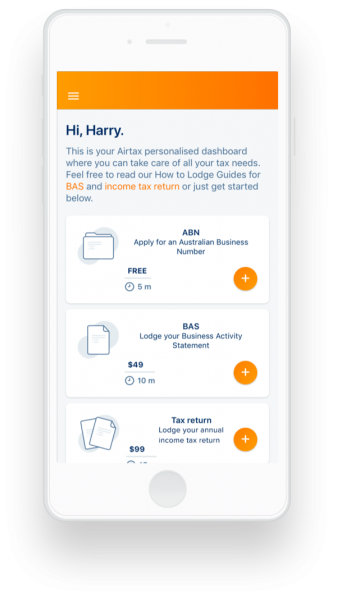 Airtax was founded by PwC Australia in 2016 and designed by certified accountants so you can be confident that your tax is being handled by specialists. We show you average expense claims, and prompt you to claim deductions you may have missed, helping to optimise your BAS. “Airtax has made the process of lodging BAS effortless and much cheaper.The Uber integration makes it hassle free so rather than collecting the partner statements and entering them myself, the app does it for me."